When St. Luke's University Health Network implemented bundled payments for 84 services under Medicare's voluntary bundled-payment program, system leaders knew they needed to whittle down the list of preferred post-acute providers to improve outcomes and save costs. By analyzing data and working with skilled-nursing facilities to improve their processes, the Bethlehem, Pa.-based seven-hospital system was able to drastically reduce readmissions and the length of patient stays at post-acute care facilities. Charlotte, N.C.-based Premier, a group purchasing and healthcare quality improvement organization, used St. Luke as an example of creating strong networks. Premier on Wednesday released a guide to help hospitals develop post-acute care networks and get a handle on the wide variation in cost and quality of care across post-acute providers that can damage a hospital's bottom line and keep it from earning incentives. “Data analysis was really key to our success, and having data on the performance of post-acute providers was extremely eye-opening,” said Donna Sabol, St. Luke's chief quality officer. “It was very evident that patients who were in managed-care products had half the length of stay in (skilled-nursing facilities) compared to those that were Medicare fee-for-service,” she said. Medicare fee-for-service plans have broad networks, while managed-care plans typically direct patients to specific providers. To create a high-performing post-acute care network, St. Luke's turned to the providers with whom it already had a strong relationship. It then collected performance data from nursing facilities to promote competition, informing them that they could be removed from the preferred list if they don't perform well enough. The system also went a few steps further to train, educate and build care protocols and transition-of-care processes for those providers. It even embedded its own physicians into the nursing facilities to better teach them protocols and held quarterly meetings with their administrative teams to talk progress. For high-risk patients, hospital physicians phoned skilled-nursing facilities to touch base once a patient was discharged, Sabol said. Skilled-nursing facilities then did the same with primary-care physicians once a patient left the facility. By the second quarter of this year, St. Luke's has narrowed its preferred post-acute care network to nine providers this year from 16 at the start of the program in 2014. The results have been dramatic, Sabol said. In 2014, the average length of stay for Medicare fee-for-service patients in the bundles was about 36 to 40 days. As of the second quarter of 2016, the nine preferred skilled-nursing facilities have reduced length of stay to 14 to 19 days on average. Moreover, St. Luke's 90-day readmission data for skilled-nursing facilities was anywhere from 34% to 45% in 2014, and now is 21% as of the second quarter of this year, Sabol said. 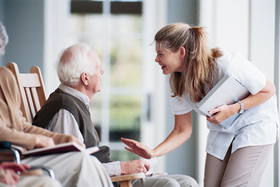 Hospitals historically have had little to do with the post-acute care that follows a patient's hospital stay, leaving physical therapy and dietary counseling up to the skilled-nursing facilities and home healthcare organizations that take over once a patient is discharged. But with new Medicare incentives that hold hospitals accountable for readmission rates, along with bundled payments requiring them to manage care for months after discharge, hospital and health system leaders must build post-acute care provider networks to reduce readmissions and promote positive patient outcomes. Premier says the majority—85%— of health system leaders are interested in partnering with preferred and local post-acute care providers. Most of them acknowledge that it's difficult to do, though. “It's a very, very diverse array of providers that encompass the post-acute space,” said Andy Edeburn, principal with Premier's population health advisory services. “Because these sites manage such different patient types, it's a challenge for hospitals or health system leaders to really know which of these are appropriate” to engage and how to start. In a nutshell, Premier said health systems should use quality and outcomes data, surveys, requests for information and on-site visits to pinpoint which post-acute care providers will best suit the hospital's needs, such as reducing admissions, and then narrow the network to those that perform best. Leaders should consistently monitor the providers in the preferred network to ensure they are performing well, and keep hospital staff informed of where they should encourage patients to seek post-acute care. It may take some heavy lifting. St. Luke's, for example, hired a program manager for bundled-payment programs along with transition-of-care specialists and other clinicians to help train post-acute care providers. It also opened up the electronic health records to the skilled-nursing facilities so they could easily access patient records. These can all be costly, but effective efforts, Premier said.